The Award-Winning Hunter 33 is a stunning New sailing yacht. Hunter’s signature window line gives this yacht the sleek feel of the latest Hunters, but the improvements don’t end there. The hull design has been improved, featuring a wider beam further aft as well as a more profound bow hollow. The result of this hull design is a longer dynamic waterline, which means more speed. The deck features a sleek, modern profile with large side windows allowing for increased interior light. The deck hatches are flush-mount, offering an enhanced look that complements the new profile. Lengthening the cockpit has allowed the new Hunter 33 to have a cockpit that is longer than its predecessor. The cockpit of the Hunter 33 also features a fold-down swim platform that extends the already lengthy cockpit when folded down while the boat is docked or at anchor. 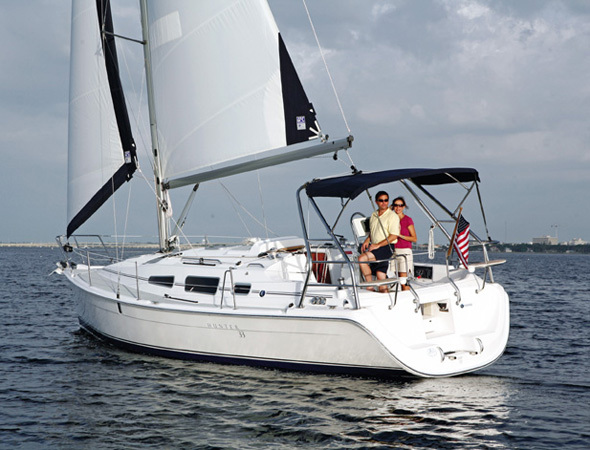 Sail Area 625 sq ft.